Authorities say they have confirmed six more deaths from Harvey, bringing the toll to at least 31. Harris County — which is home to flood-ravaged Houston — confirmed the additional deaths Wednesday night and said they still needed to do autopsies on another eight people to see if their deaths were storm-related. The deaths announced Wednesday included a man who stepped on live electrical wire in floodwaters and an evacuee who was found unresponsive on a charter bus. Most of the other deaths were drownings. State officials say floodwaters from Harvey toppled two oil storage tanks in south Texas, spilling almost 30,000 gallons of crude. Burlington Resources Oil and Gas reported the spills in DeWitt County to the Texas Railroad Commission on Wednesday. They include a 16,170-gallon (385 barrels) spill near the town of Westhoff and a 13,272 gallon (316 barrels) spill west of Hochheim. That’s an area about 150 miles west of Houston. It was not immediately clear if any of the spilled oil was recovered. About 8,500 gallons (200 barrels) of wastewater also spilled. Burlington Resources is a subsidiary of ConocoPhillips. Company representatives did not immediately respond to telephone and email messages seeking comment. More damage to oil industry infrastructure is expected to emerge as floodwaters recede. Houston officials say they are working to resume various city operations now that the flood waters from Tropical Depression Harvey have begun to recede. Bus service and the city’s light rail system are set to resume on a limited basis starting on Thursday. The city’s trash collection service resumed on Wednesday with heavy trash pickup. Regular trash pickup for the city was set to resume on Thursday. Most city employees are not set to return to work until Tuesday. Houston Fire Department officials say they will begin doing a block-by-block search of neighborhoods that were flooded by Tropical Depression Harvey and had previously been inaccessible to authorities. Houston Fire Chief Samuel Pena says firefighters will begin searching neighborhoods in southwest Houston starting Thursday morning. Assistant Fire Chief Richard Mann says the searches are being done to ensure that “no people were left behind.” Floodwaters in many parts of Houston have receded while other neighborhoods are still dealing with rising waters from bayous and other swollen waterways. Mann says the fire department will conduct these searches throughout the city. Officials expect the process to take one to two weeks to complete. Mann says since Harvey inundated the Houston area, the fire department has received more than 15,000 calls for service. He says the volume of calls has stabilized and the fire department is working to transition from rescues calls to a recovery mode. A top county official says Tropical Depression Harvey has taken two lives in Orange, Texas. Orange County Judge Stephen Carlton would only say the two died Monday night in the city of Orange and that the deaths were storm related. He provided no other details. The fatalities bring the number of confirmed deaths to 25. The National Hurricane Center has downgraded Harvey to a tropical depression, but warns of continuing flooding in parts of Southeast Texas and southwest Louisiana. In its Wednesday evening update, the hurricane center said Harvey is located about 10 miles (16.09 kilometers) southwest of Alexandria, Louisiana, and has maximum sustained winds of 35 mph (56.32 kph). The center said the threat of heavy rains has ended for the Houston and Galveston areas, but “life-threatening” flooding will continue in and around Houston, Beaumont, Port Arthur and southwest Louisiana. Harvey is expected to produce an additional 4 to 8 inches of rainfall along the Texas-Louisiana line. The Leonardo DiCaprio Foundation has donated $1 million to the newly established United Way Harvey Recovery Fund which will go toward relief and recovery efforts for several years. United Way Worldwide said Wednesday that the national fund will distribute 100 percent of donations to recovery efforts for those affected by Hurricane Harvey. United Way is the world’s largest privately-funded non-profit. The $1 million from the actor’s foundation represents the inaugural donation to the fund. It is the latest disaster relief support from the Oscar-winner’s namesake foundation. Many celebrities have pulled out their pocketbooks to help Harvey victims over the past few days including Sandra Bullock, who on Tuesday donated $1 million to the American Red Cross. In Houston’s flooded Meyerland district, hundreds of families have been emptying their homes of sodden possessions under a baking sun as temperatures crawled up into the 90s. On Wednesday, they piled couches, soggy drywall and carpets ripped out of foul-smelling homes where floodwater had lingered for more than 24 hours. The curbs were lined with the pickup trucks of cleanup contractors and friends. For Harry Duffey, a 48-year-old computer security specialist, this was flood No. 3 in as many years. He’d moved his family of six back into their one-story ranch a block and a half from Bray’s Bayou eight months ago — after a second remodeling. They figured that if it flooded they’d just drive to their old house about a mile away on higher ground. But they waited too long. In no time the water was up to their knees and would reach four feet. They quickly headed to their neighbor’s home. The neighbor rebuilt following an earlier flood on a six-foot foundation, which is what Duffey wants to do now. He’ll apply for a federal flood grant and hope it’s approved because he can’t afford what it would cost to elevate his home. Just before the flood, Duffey got a notice that his flood insurance premium had nearly doubled to $5,300 a year. But Duffey has no intention of moving out. First, he can’t afford it. Second, he loves the community. The CEO of a chemical plant northeast of Houston says it could explode and cause an intense fire. Arkema president and chief executive Rich Rowe said Wednesday that the floodwaters from Harvey and the lack of power are keeping the company from preventing an explosion. The company says the chemical compounds must be stored at low temperatures. He said there is 6 feet of water at the plant and they have lost critical refrigeration of the materials. Arkema makes organic peroxides in Crosby, about 25 miles (40 kilometers) northeast of Houston. Officials have evacuated the plant and homes within 1.5 miles (2.4 kilometers) of the plant. Arkema said it shut down the Crosby site before Harvey made landfall last week, but a crew of 11 had been kept onsite. That group was removed Tuesday. Wednesday afternoon brought the unusual sight of Louisiana’s governor holding a news conference on Texas soil. Louisiana Gov. John Bel Edwards visited a command post set up by Louisiana government agencies on the side of Interstate 10 in Orange. School buses and transit buses were sent from Lake Charles to carry evacuees to two shelters the state is running there. Louisiana has also opened a shelter in Alexandria, the largest city in the central part of the state. Edwards said he’d spoken to Texas Gov. Greg Abbott Wednesday about the effort. He said Louisiana would assist for “however long it takes,” saying the state owes its western neighbor a debt for its aid in 2005. Edwards is asking for expansion of a federal emergency disaster declaration as Tropical Storm Harvey moves through the state. President Donald Trump already has issued such a declaration for five southwestern parishes: Beauregard, Calcasieu, Cameron, Jefferson Davis and Vermilion. Edwards is seeking the addition of Allen, Acadia, Iberia, Natchitoches, Rapides, Sabine and Vernon. The declaration authorizes the federal government to cover 75 percent of costs of certain emergency protective measures. Xyrius Langston stood at the edge of a pond in the Houston suburb of Missouri City holding a fishing rod. Several family members were fishing nearby. It was the third pond they had visited Wednesday, looking for something to bite. Langston’s family spent three days inside their home in Missouri City as the floods outside reached their driveway. He says it was getting “kind of chaotic” inside so he decided to go fishing. Standing at the pond, Langston said he hadn’t caught anything in several hours and didn’t expect to catch anything. His favorite spots along Matagorda Bay, on the other side of Houston, are still too difficult to reach as many highways and roads remain flooded. But Langston said he couldn’t fully enjoy the weather, knowing how much of the region remains flooded in. He says he would be helping rescue people if he had a boat. Water is continuing to rise on Buffalo Bayou in Houston because of releases from one of two reservoirs in west Houston even though the rain from Tropical Storm Harvey has stopped. Harris County Flood Control District meteorologist Jeff Lindner says it is hard to forecast what happen because several gauges that have been knocked out by the surging waters. Buffalo Bayou heads west to east across Houston toward downtown. Lindner says he would not be surprised if the number of homes flooded reaches 100,000 in Harris County. Forecasters predict a wobbling and weakening Harvey will be downgraded to a tropical depression late Wednesday or early Thursday and that the killer storm will completely dissipate within three to four days. But with 40 mph (64 kph) winds as of Wednesday afternoon, Harvey still has lots of rain and potential damage to spread, this time further north. The National Hurricane Center says that Harvey should drop 4 to 8 inches more of rain from the Louisiana/Texas border northeastward into Tennessee and Kentucky through Friday. Some spots may get as much as a foot of rain. Flooding is a possibility. The threat of heavy rains for Houston has ended, but catastrophic and potentially deadly flooding will continue around Houston, Beaumont, Port Arthur and southwest Louisiana for the rest of the week. Among the places to open their doors to victims of Harvey’s flooding is a bowling alley in the coastal Texas city of Port Arthur. Max Bowl general manager Jeff Tolliver says firefighters called Tuesday night to ask him to turn off the venue’s alarm system. When he left around 2:30 a.m. Wednesday, there were 80 to 100 people sheltering there. By afternoon, there were more than 500, as well as 50 to 100 dogs and cats, a lizard and a monkey. He says the monkey “was a little surprising,” but that everyone is trying to help. The bowling alley’s cafe is feeding people and others have been dropping off clothes, toiletries, water and other things. Tolliver and his wife left their flooded home to stay with friends. He says he moved to Texas from Michigan a year ago to get away from the snow, but ended up with rain instead. Authorities say a married couple who drove their pickup truck into Harvey’s floodwaters has drowned after the current from a nearby creek swept them away. Fort Bend County Sheriff’s Maj. Chad Norvell says the couple was on the phone with 911 asking for help when the line went silent. When officers found the truck, it was completely submerged. Norvell identified the couple as 65-year-old Donald Rogers and 58-year-old Rochelle Rogers. They lived in a rural area of the county southwest of Houston and they were headed to a relative’s house nearby. The deaths raise the toll from Harvey to at least 23. A Houston-based telemedicine practice has made its virtual network of 50 doctors available for free to patients affected by Harvey. Dr. Latisha Rowe said Wednesday that Rowe Docs’ physicians are coordinating with doctors and nurses volunteering at shelters to treat and write prescriptions for Harvey evacuees who fled their homes without medicine or who sustained injuries on the way out. She said the greatest threat in shelters comes from the contaminated water many people treaded through to safety. She said infections need to be “contained and controlled” so they don’t spread. Among the network’s doctors is Angela Nunnery, who escaped her flooded home on Houston’s north side by boat and dump truck with her husband, children, 78-year-old mother and two dogs. In addition to a daily shift attending patients online, Nunnery has been volunteering at her church — a makeshift shelter for about 150 evacuees. She said local pharmacists have been providing patients with a week’s supply of free medicine. Tropical Storm Harvey has spawned at least one tornado in Mississippi and created bands of strong winds that damaged homes and toppled some trees. The National Weather Service says the tornado touched down Wednesday in the southern Mississippi town of Petal, which is near Hattiesburg. Local news outlets showed photos of damaged fences and shingles pulled off a home. No injuries were immediately reported. The weather service was trying to determine whether damage further south was caused by tornadoes or other strong winds. Meteorologist Alek Krautmann says damage was reported in Pearl River County, in the city of Biloxi and in a subdivision between Ocean Springs and Gautier (GO-shay). He says Harvey also caused flash flooding before dawn Wednesday in parts of Pascagoula. This version of the Latest corrects the last word of the 3:50 p.m. item to Pascagoula. The Environmental Protection Agency has issued emergency waivers allowing states from Maryland to Texas to ignore some clean-air requirements for gasoline to ensure an adequate fuel supply despite disruptions caused by Harvey. EPA Administrator Scott Pruitt says the waivers issued Wednesday will help ensure an adequate supply of fuel throughout the South, Southeast and Mid-Atlantic. In a letter to governors, Pruitt says the shutdown of nearly a dozen refineries and extreme weather conditions that have prevented fuel-barge movement in the Gulf Coast region justify the waiver. The designated states receive significant gasoline supplies from Gulf-area refineries. The waivers are effective immediately and continue through Sept. 15 at least. Affected states are Alabama, Florida, Georgia, Kentucky, Louisiana, Maryland, Mississippi, North Carolina, South Carolina, Tennessee, Texas and Virginia, as well as Washington, D.C. Residents of a retirement home in Orange, Texas are being evacuated by airboat from the flooded facility about 30 miles east of Beaumont. Agents from the Florida Wildlife Commission and two trucks from the Louisiana Army National Guard are participating in the evacuation of the Golden Years Retirement home. Water in the parking lot was thigh deep about 3 p.m. Wednesday as guardsmen entered the building and carried residents from the second floor where they had been sheltering in a dry area of the small facility. 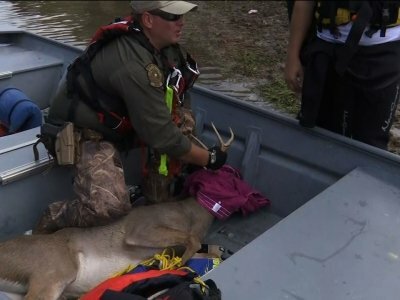 Wildlife agents then floated the residents, one-by-one in a Wildlife Commission airboat to the truck. About six residents had been rescued as of midafternoon and it was unclear how many more were sheltering on the second floor. Texas Health and Human Services records show Golden Years has a licensed capacity of 16. Department spokeswoman Carrie Williams said more than 2,800 residents of about 120 long-term care facilities in areas affected by Harvey had been evacuated by Tuesday. That number was expected to grow. The VA North Texas Health Care System in Dallas says 20 of its nurses have headed to Houston to relieve the staff at Houston’s beleaguered Veterans Affairs hospital. The team will join a 25-member team from the Austin-based Central Texas Veterans Health Care System, and 15 professionals from San Antonio-based South Texas Veterans Health Care System. According to a statement Wednesday, Houston’s VA hospital has had about 700 staffers staying onsite, sleeping on floors, in the auditorium and in offices to keep the facility open throughout the disaster. A former U.S. Army ranger swam through flood waters to the hospital to be treated for a burst appendix. Fort Bend County Sheriff Troy Nehls says one man is being detained and another is hospitalized in critical condition after an apparent road rage shooting in storm-related traffic. The sheriff said high water across many streets and roads in the county west and southwest of Houston has forced traffic to the few roads opened, leading to congestion. Nehls says the man in custody after the shooting Wednesday afternoon is telling investigators he does have a license to carry a gun. Harris County Sheriff Ed Gonzalez says the bodies of six members of a Houston family have been recovered from a van that was swept off a Houston bridge and into a storm-ravaged bayou. Gonzales says relatives returned to the scene Wednesday to look for signs of the van and notified authorities after spotting part of it poking above the water and seeing two bodies in the front seat. The van was recovered from about 10 feet (3 meters) of muddy water in Green’s Bayou in northeast Houston. Gonzalez says bodies of two adults were recovered from the front seat and the four children were found in the back. He said it appeared the van was a work truck and the back section was separated by a steel screen partition. Samuel Saldivar told deputies he was in his brother’s van rescuing his parents and relatives from their flooded home Sunday when the van was tossed by a strong current into the bayou as it crossed a bridge. He escaped through a window but the others were trapped. The victims included his parents and their four great-grandchildren ranging in age from 6 to 16. Some motorists have been stranded along Interstate 10 in southeast Texas for nearly 24 hours after they pulled off the freeway but couldn’t re-enter. More than two dozen vehicles, including a TV news crew’s, remained clustered Wednesday afternoon around a closed convenience store in Orange, Texas. I-10 is elevated and passable between Orange and Lake Charles, Louisiana, about 35 miles to the east. But many on- and off-ramps are too flooded from Harvey’s rains to allow vehicles to pass. Erin Gaudet of Beaumont, Texas, is among those stranded at the store. She said she left her house Tuesday to pick up a kitten, then had to spend the night with it in her SUV. She says she’s planning to name it Harvey. Harvey made landfall again Wednesday near the Texas-Louisiana border. About 10,000 additional National Guard troops from around the U.S. are being deployed to Texas as Harvey continues dumping rain on the region. Gov. Greg Abbott said Wednesday that “the worst is not over” for southeastern Texas as widespread flooding continues. The Republican says the arrival of additional Guard members from around the country will bring the total number of deployments to about 24,000. Abbott earlier this week activated all available members of the Texas National Guard. Abbott says the Guard has conducted more than 8,500 rescues and more than 1,400 shelter-in-place and welfare checks. A woman whose body was found floating in floodwaters near a residential area in southeast Texas is believed to be at least the 21st person to have died in Harvey’s path. Beaumont police say the woman’s body was discovered Wednesday morning. Authorities have not released her name and are not certain of the circumstances that led to her death. The woman is the second person to have died in Beaumont this week. Authorities found a shivering 3-year-old clinging to the body of her drowned mother in a rain-swollen canal Tuesday after the woman tried to carry her child to safety. Beaumont police on Wednesday identified the mother as 41-year-old Colette Sulcer and said her daughter was being treated for hypothermia but doing well. Forecasters are looking at a weather system off the Mexican coast just south of Texas that they say has a one-in-five chance of developing into something tropical in the next five days. Dennis Feltgen, a meteorologist at the National Hurricane Center, says if it does develop, it would do so slowly and that it shouldn’t be seen as an imminent threat. He says it wouldn’t necessarily hit Harvey-flooded areas, but there’s a chance. The system is so far out that forecasters can’t say how much more rain it would bring. Hurricane Harvey has weakened to a minimal tropical storm, with maximum sustained winds of 40 mph (64 kph), down from 45 mph (72 kph). Warnings and watches have been dropped for nearly all of Texas, except Sabine Pass. A 36-year-old inmate scheduled for execution in Texas next week has been granted a temporary reprieve because of Harvey. Bexar County prosecutors cited “extraordinary circumstances” in asking to move Juan Castillo’s execution to Dec. 14 because some of his legal team is based in Harris County, which has been slammed by the tropical storm. On Wednesday, a state judge agreed. Gov. Greg Abbott has designated Harris County — which includes Houston — a disaster area along with dozens of other Texas counties after the tropical storm submerged Southeast Texas with torrential rain. Castillo had been scheduled for lethal injection Sept. 7 in Huntsville for the slaying of 19-year-old Tommy Garcia Jr. during a 2003 robbery in San Antonio. Louisiana Gov. John Bel Edwards says the threat of flooding in the state’s southwest appears to be diminishing as Harvey pulls away from the region. He says Louisiana remains committed to assisting officials in Texas, where another overnight round of torrential rains stranded many residents in flooded homes. Edwards says 330 people were staying at a Lake Charles shelter as of Wednesday afternoon. He expects that number to grow as more people are rescued from floodwaters in eastern Texas, just across the state line. He says a shelter in Shreveport is ready to accommodate up to 3,400 flood victims from Texas if officials accept the state’s offer to shelter them in northern Louisiana. Edwards planned to travel to southwest Louisiana on Wednesday afternoon to meet with local officials there. Residents along the Texas-Louisiana border are feeling Harvey’s second punch as flash flooding inundates homes and overwhelms first responders trying to pluck people from the water. Police in Beaumont, Texas, have been recruiting anyone people with boats Wednesday to help check neighborhoods for potential rescues. Police said many were not calling 911, instead calling for help on social media, adding to the chaos. Twenty-five miles west in Orange, Texas, Anna McKay says she tried calling 911 for help, but nobody answered. Neighbors helped bring her and 12 other people who had sought refuge at her home to dry ground. They gathered at a Baptist church where people were planning to cook food to offer comfort. Harvey made its second landfall Wednesday as a tropical storm after roaring ashore last week as a hurricane. Downtown Houston business district officials say the city’s center has survived Harvey in relatively good shape, though flooding has damaged several buildings, including City Hall and the city’s main performing arts centers. Officials said Wednesday that flooding damaged the ground floor or basements of more than two dozen buildings or businesses downtown, primarily along Buffalo Bayou, a river-like waterway that meanders west to east through the city. Among the damaged buildings are the Alley Theatre, Wortham Theater Center, Hobby Center and Jones Hall, home of the Houston Symphony. Streets to and within downtown are open, although some freeway exit ramps leading into downtown remain impassable. There are some scattered power outages and some traffic signals are out. There is isolated flooding in the pedestrian tunnels what wind through downtown. The federal Department of Education is easing financial aid rules and procedures for those affected by Harvey. The department is encouraging students whose financial needs have been altered by the storm to contact their school’s financial aid office. The agency says in a statement that colleges and career schools will be allowed to use “professional judgment” to adjust a student’s financial information in the aftermath of Harvey. A school may even be able to waive certain paperwork requirements if documents were destroyed in the flooding. The department says borrowers struggling to pay off loans because of Harvey should inform their loan servicers — and they’ve been directed to give borrowers flexibility in managing loan payments. All students in the largest district in Texas will be eligible to receive three free meals per day at school as the state recovers from Harvey. The Houston Independent School District on Wednesday announced the plan promising free meals on campus to 216,000 students during the 2017-2018 school year. An HISD statement says federal and state agriculture departments have waived the usual required application process, part of the National School Lunch/Breakfast Program, to help with Harvey recovery. Superintendent Richard Carranza says the waiver will give families one less concern as they begin the process of restoring their lives. Thousands of people have been forced from their homes in Houston since Harvey struck, submerging the city with torrential rain. There are more than 32,000 people in shelters across Texas as Harvey continues drenching the state’s Gulf Coast. Gov. Greg Abbott says Texas also has an additional 30,000 beds “available as needed” for those who fled or are still fleeing floodwaters associated with the storm. At a news conference in Austin, Abbott said there are still about 107,000 power outages statewide, down from nearly 140,000 over the weekend. Harvey roared ashore as a hurricane Friday, then triggered deadly floods as a tropical storm. Abbott refused to speculate on the final costs of the storm in terms of property damage. But he suggested that the scope of destruction far exceeded that of Hurricane Katrina in 2005 or 2012′s Superstorm Sandy, meaning the financial impact will likely be far greater than both. Officers have located a submerged van in which six members of a Houston family were traveling when it was swept off a Houston bridge and into a storm-ravaged bayou. Harris County Sheriff Ed Gonzalez says the van is in about 10 feet (3 meters) of muddy water in Green’s Bayou in northeast Houston. He says the bodies of two adults can be seen in the front seat but that if the four children’s bodies are inside they are obscured because of the water conditions and the angle of the vehicle. Authorities are trying to decide whether dive team members will retrieve the bodies or if it would be safer to pull the van from the treacherous water first. Samuel Saldivar told deputies he was in his brother’s van rescuing his parents and relatives from their flooded home Sunday when the van was tossed by a strong current into the bayou as it crossed a bridge. He escaped through a window but the others were trapped. Authorities say a 3-year-old girl who was found clinging to the body of her drowned mother in a rain-swollen canal in Southeast Texas is doing well and should be released from the hospital soon. Beaumont police on Wednesday identified the girl’s mother as 41-year-old Colette Sulcer. Officer Carol Riley says the toddler, who was suffering from hypothermia when she was rescued Tuesday afternoon, has now been reunited with her family. Riley says the girl is in stable condition and should be released from the hospital on Wednesday. Authorities have said the mother’s vehicle got stuck in a flooded parking lot of an office park just off Interstate 10. A witness saw the woman take her daughter and try to walk to safety when the swift current of a flooded drainage canal next to the parking lot swept them both away. Officials say the child was holding onto the floating woman when police and fire-rescue team in a boat caught up to them a half-mile downstream. U.S. Immigration and Customs Enforcement says it has assigned about 150 employees from around the country to help with disaster relief efforts in Houston. The agency said Wednesday that 139 agents and officers from Atlanta, Chicago, Dallas, Detroit, El Paso, Houston, Washington, New York, San Diego and Tampa are on scene. They are on 25-member teams that answer to the Federal Emergency Management Agency. ICE also has another dozen employees on another team that assists FEMA. It says it is prepared to send more employees if needed. The agency says it is not doing immigration enforcement operations in storm-affected areas.